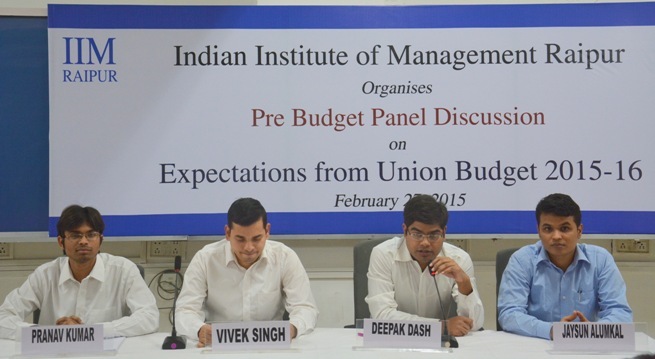 As the nation waits with bated breath to hear what government has to present in its budget, IIM Raipur held a pre-budget discussion to find out what the young minds of the institute expect India’s Finance Minister to deliver on February 28th, 2015. The first panel discussion revolved around ‘Agriculture and Rural Development’ where IIM Raipur students spoke about how India’s agricultural sector needed a stimulus. The panel examined some of the shortcomings of the previous budget with respect to the agricultural sector and identified key areas of focus in order to provide a much needed boost to the sector. The panel dwelled upon the need for skill development in the agricultural sector. Although sufficient infrastructure was in place to facilitate skill development in the agricultural sector it was seldom used effectively. Budgetary allocations to improve the quality of agricultural training institutes that might encourage more candidates to enrol into courses related to agriculture.The panel also proposed a better unbiased tax structure to ensure and promote an organized agro based industry.The students ended the discussion with how the expectations from the budget are high and how it would certainly bring in policies that would improve the sector that is the largest source of employment in the country. The second panel discussed and deliberated over ‘Infrastructure and Industry’. The students spoke on the performance and expectations of the manufacturing and infrastructure sectors.India’s development story depends heavily on how the country’s infrastructure and industry sector perform.The panel put forth the five major expectations for the ecommerce industry from the upcoming budget. A clearly defined path for FDI in retail to take advantage of the supply chain capabilities of global retailers, tax incentives to boost investment in logistics, technology and general infrastructure were some of the measures proposed for development of the ecommerce industry. The discussion primarily dealt with the needs of the IT & ecommerce, Road infrastructure and Manufacturing sector specifically the Micro, Small, and Medium Enterprises. The third panel discussion was on ‘Social Sector Programmes.’ The students broadly discussed topics like job creation, poverty alleviation, social healthcare, education, food, water, sanitation and so on. Students proposed budget allocation on nation-wise incubation centre and to encourage SMEs and social entrepreneurship. Provisions for tax benefits for specially abled and senior citizens would be helpful to the country. Larger allotment for schools and research in biotechnology would help the education and healthcare sectors. The event’s final panel discussion was on ‘The Financial Sector’ in which the students talked about the banking sector, insurance sector, capital market and taxation. The banking sector has been experiencing an increase in the percentage of non-performing assets. The panellists noted how tax contributes to 10.66% of the country’s GDP. However, only 10% of Indians pay their taxes. The panel’s discussion revolved around direct tax, indirect tax, goods and trade tax and retrospective tax regimes. The Government of India should set clear policy and stand by them. Retrospective amendments are detrimental towards the investment climate of the country. Taxation should be made investor friendly and transparent tax structure should be encouraged. GST remains the most important component of tax reforms. Through policies that promote financial inclusion of the rural sector, the Budget 2015-16 will certainly help the rural areas develop. The pre-budget discussion at IIM Raipur was encouraged by the professors so that it creates knowledge sharing opportunities. It created awareness and gave the students an opportunity to opine on matters that will affect them directly or indirectly. Such discussions will keep the tradition of learning and sharing ideas alive in the young and bright minds of the future of this country. As a noble initiative towards attracting investment in the Indian manufacturing domain, honourable Prime Minister of India launched an ambitious ‘Make in India’ campaign. On this backdrop, every Indian is eagerly waiting for the Union Budget of 2015-2016 to see how the Union Budget would lay path for the policy initiatives by the Central Government to push growth and development of the Indian economy. For the benefit of the Corporates, Government, Institutions, and people at large, IIM Raipur is organizing a Post-Budget Panel Discussion on the theme : "Union Budget 2015-2016: Impact on Make in India", on 28/02/2015 from 06:30 PM to 08:30 PM where the panelists for the discussion would be - Shri. D.S. 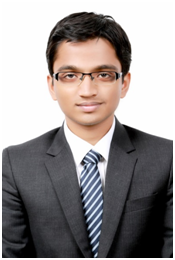 Misra, Additional Chief Secretary, Government of Chhattisgarh ; Shri. Pradeep Kumar, Commissioner (Central Excise, Customs & Service Tax), GOI; Shri. B.K. 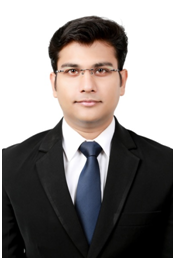 Mohanty, Accountant General, Chhattisgarh; Shri. Dinesh Agrawal, Chairman CII Chhattisgarh Chapter; CA ShashikanthChandrakar, Chairman Raipur Chapter, ICAI. To improve India’s Gross Enrollment Ratio (GER) across schools and increase student retention, it is need of the hour that joint collaborative efforts between private sector and the government promote quality education for all. Considering the focus of the government on ‘Make in India’ campaign, there is an anticipation for an announcement to make the vocational training environment more conducive which will help produce employable skilled workforce. Dairying contributes close to a third of the gross income to an estimated 70 million rural households. Of these about three-fourth are landless, marginal or small farmers and are engaged in milk production. The budget must handhold these small holders by giving them interest free loans for purchase of milking animals and setting up dairy units of 10-15 milking animals. There is an urgent need to create retail policies for e commerce businesses, and to set up a more efficient internal trade policy. Players are to be assisted in securing international funding without having to give up on their management control. The e-commerce and IT sectors have big hopes from the 2015 Budget, and the new government has to find a balance between the requirements of growth, and with the establishment of strong policy and regulatory framework in order to provide sustainable growth opportunities.